All actions are stated in CET.Started as the fourth ship in the I Division, behind Helgoland and ahead of Posen. At 18:30 confronted Nestor and Nomad. 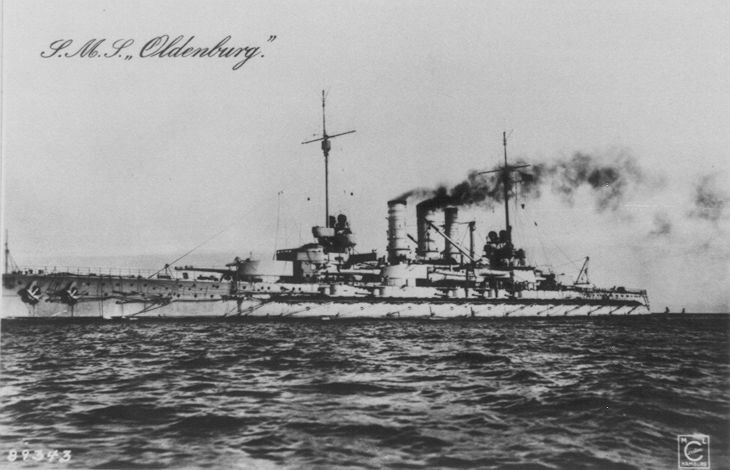 OLdeburg helped destroy Nestor which sank at 18:35. After 19:15 fired and straddled Warspite but had to retire quickly.During the night formation, Oldenburg was fifth ship in the line.At 01:10 battled with the six destroyers of the 4th DF. Fired on Porpoise and Fortune at close range although Fortune put a 4" shell into the searchlights causing serious injuries on the bridge. After Höpfner took the wheel to recover the formation, Ardent was taken under fire and along with Fortune sunk. Three shafts with three vertical triple expansion steam engines providing 22,600 shp.